These journals were created because a lot of family and friends wanted us to share our journeys with them. 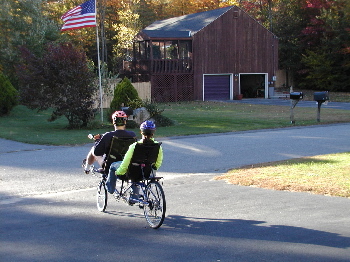 The Rear Admiral (Mary) and I started riding our first tandem (Clyde) in 1997. She began to warm to this new hobby, and for that I will always be in her debt. As she developed more faith in my driving abilities, our riding turned to bike touring. We hope you enjoy these journals as much as we enjoy to ride. Please feel free to send us feedback and suggestions.